Porteu instruments i propostes, si voleu contacteu abans amb en Panxito: 606.435.621. Probably these people have already exercised their vote by mail. It is possible, therefore, that many people have already done so, without having even received a census card at the fraudulent home. The journalist @BeatrizTalegon is collecting the cases of false census cards that arrive at domiciles. If you get it, send it to them. https://twitter.com/beatriztalegon/status/939867020589494272. Spread this message to reach everyone, please. Probablemente estas personas ya han ejercido su voto fraudulento por correo. Es posible, por tanto que muchísimas personas lo hayan hecho ya, sin que haya llegado ni siquiera tarjeta censal al domicilio falso. La periodista @BeatrizTalegon está recogiendo los casos de tarjetas censales falsas que llegan a domicilios. Quien reciba alguna de ellas la puede remitir a https://twitter.com/beatriztalegon/status/939867020589494272. Difundan el mensaje para que llegue a todos, por favor. Diverses persones han rebut a casa targetes censals de persones desconegudes, textualment: "Arriben targetes censals a casa de gent que no hi ha viscut mai. Són noms castellans, de nascuts el 1926 i 27, el DNI comença per 17. 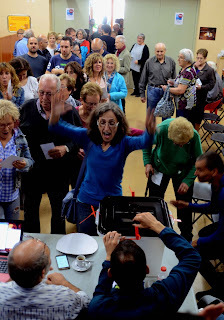 Aquesta podria ser una via de FRAU ELECTORAL. Coneixeu algun altre cas? És IMPORTANT. 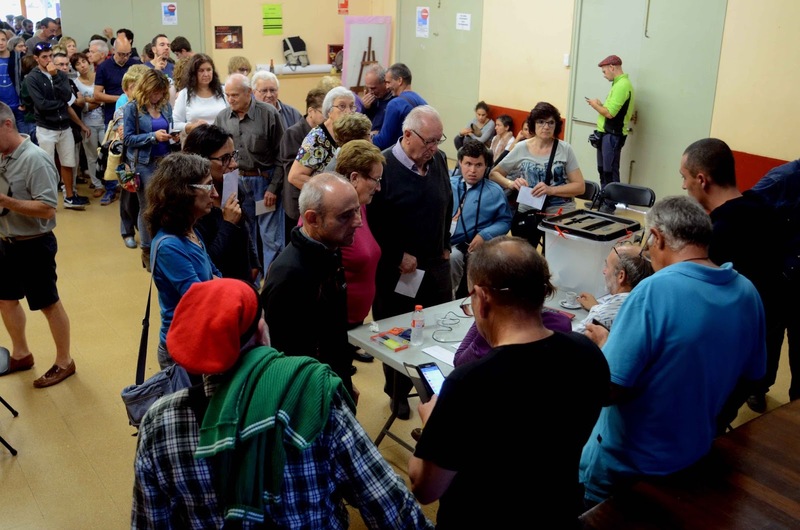 #frauelectoral"
Probablement aquestes persones ja han exercit el seu vot per correu. És possible, per tant que moltíssimes persones ho hagin fet ja, sense que hagi arribat ni tant sols targeta censal al domicili fraudulent. Difoneu el missatge perquè arribi a tothom, si us plau. Hem viatjat aquesta nit des de Besalú per fer costat als parlamentaris que declaren avui al tribunal suprem. No descartàvem un clima hostil. Ens hem sentit acompanyats per un grup de republicans locals que ens han recolzat. 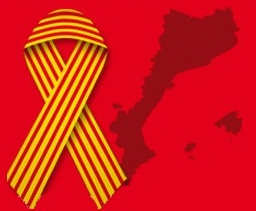 Visca la solidaritat dels pobles! 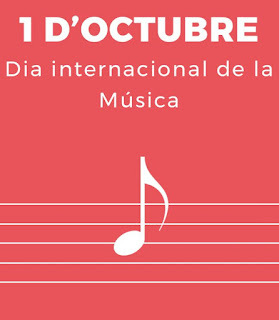 L’1 d’Octubre* celebrem el dia internacional de la música.Descarrega't el cartell i comparteix-lo. A tot Catalunya hi haurà grans cantades corals per celebrar-ho! Ves d'hora al local on està previst que cantis (tots els cantaires tenim un lloc assignat). S'hi haurà reunit molta gent que, com tu, té moltes ganes de cantar. A l'escola hi haurà partitures per tothom. Però porta-la de casa per si de cas. Recorda: ha de ser preferiblement en Si major. Un cop hagis cantat la teva cançó, deixa la partitura en les caixes ja preparades. D'aquesta manera els organitzadors de la festa sabran quants cantaires han vingut i si els catalans cantem bé en Si major... o no. Tu ja m'entens. I tant que sí. El diumenge 1, tothom a cantar! *L’any 1975, la UNESCO va establir l’1 d’Octubre com a Dia Internacional de la Música, per commemorar-la en les seves diferents manifestacions i la seva trascendència a nivell internacional. Catalunya in state of siege. 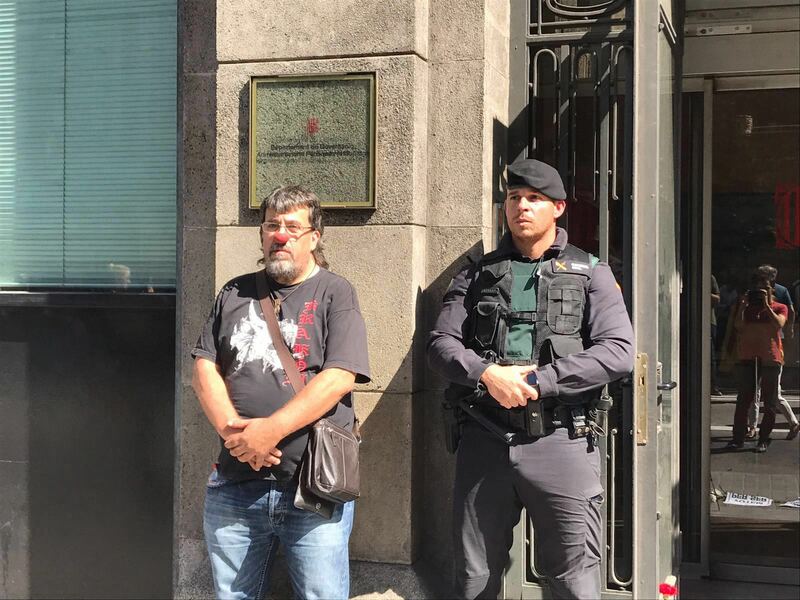 Chronicle of "sedition" and the "tumult"
"The Prosecutor's Office files a complaint for sedition for the Barcelona concentrations and points to ANC and Òmnium The Public Ministry considers that the demonstrations were "tumults", coinciding with the arguments of the Government." 2. any action, especially in speech or writing, promoting such discontentor rebellion. 1. violent and noisy commotion or disturbance of a crowd or mob; uproar. 2. a general outbreak, riot, uprising, or other disorder. 3. highly distressing agitation of mind or feeling; turbulent mental or emotional disturbance. In the debate on the referendum and the process towards independence, unionism has spread some statements that are lies, easy lies to contrast. We offer you the five thickest and the links that will be used to prove to anyone that they are false. That is a lie. Leaving aside the fact that the referendum is protected by the Law of the Referendum on Self-determination of the Parliament of Catalonia, even with the penal code and the Spanish legal system making a referendum can not be considered a crime. The call for a referendum has not only been defined as a criminal offense but has been evident - both in the Spanish Congress and the Spanish Constitutional Court - that it is not. The PP changed the criminal code through the arbitration law, in 2003, to try to entice the Basque president. This reform of the penal code was annulled by the Constitutional Court and also by the congress on the initiative of the then Prime Minister, Rodríguez Zapatero. An habitual lie of former Minister García-Margallo is that there are only three constitutions in the world that speak of the right of self-determination. This is utterly false. There are thirty-eight constitutions which refer to the right of self-determination and invoke it as a source of legitimacy. Examples include the nine states of the twenty-eight of the European Union: Germany, Croatia, Slovakia, Slovenia, Estonia, France, Hungary, Latvia and Portugal. Here you can find all the references. 3. Spain can not accept the referendum on self-determination because it is prohibited by the constitution. The rules regarding the fundamental rights and the freedoms that the Constitution recognizes will be interpreted in accordance with the Universal Declaration of Human Rights and the treaties and the international agreements on these matters ratified by Spain. The valid international treaties will be part of the internal regulations once they have been officially published in Spain. Its provisions may only be repealed, modified or suspended in the manner provided for in the treaties themselves or in accordance with the general rules of international law. All peoples have the right to self-determination. By virtue of this right they freely determine their political status and also seek for their economic, social, and cultural development. I approve and ratify everything that is available, and I promise to comply, observe and enforce and observe in all its parts in a timely manner. Consequently, Spain is forced to comply and observe the right of self-determination of the people, since it can not repeal the obligation imposed by the UN and accepted by the signing of the conventions. - Between 1810 and 1812, the Principality was a completely independent state, which had a close relationship with the French Empire. -On March 1873, the Diputació de Barcelona proclaimed the Catalan state, which included the four provinces of the Principality and the four Balearic and Pitiüses islands. This state was integrated into the borning first Spanish republic. -In 1931 and 1934 the Republican Generalitat proclaimed the Catalan Republic. Francesc Macià did it on April 14, 1931, a few hours before Madrid was proclaimed the Spanish republic. 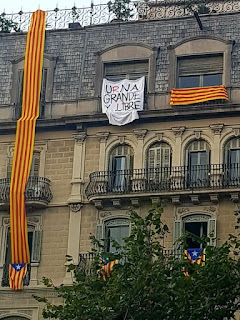 Three days later, Macià accepted that the Catalan Republic was part of the Spanish. Lluís Companys also proclaimed the Catalan Republic on October 6, a proclamation that was aborted militarily by the Spanish republic. But the most important argument is that it is impossible for the source of legitimacy of the Generalitat de Catalunya to be the Spanish constitution, taking into account that the Generalitat was restored by Spain before the constitution existed. The restoration of the Generalitat is made by Royal Decree Law 41/1977 of October 5 (you will find it here), which recognizes the legitimacy of President Josep Tarradellas, the president elected by the institutions of the republic. The Spanish constitution was not approved until December 29, 1978, which is when published in the BOE: the Generalitat of Catalonia has been operating for more than a year. Finally, following the unilateral independence of Kossove, a historic ruling from the International Court of Justice (which you can find here) made it clear that international law did not contain any prohibition that could be used to stop a unilateral declaration of independence. En el debate sobre el referéndum y el proceso hacia la independencia, el unionismo ha difundido algunas afirmaciones que son mentiras, unas mentiras fáciles de contrastar. Ofrecemos las cinco más gruesas y los enlaces que le servirán para demostrar a cualquiera que son falsedades. Eso es mentira. Obviando el hecho de que el referéndum está amparado por la Ley del Referéndum de Autodeterminación del Parlamento de Cataluña, incluso con el código penal y el ordenamiento jurídico españoles hacer un referéndum no puede ser considerado delito. La convocatoria de un referéndum no sólo no ha sido definida como delito en el código penal, sino que se ha puesto de manifiesto tanto en el congreso como al Tribunal Constitucional españoles- que no lo es. El PP cambió el código penal por medio de la ley de arbitraje, en 2003, para tratar de encausar el presidente vasco. Esta reforma del código penal fue anulada por el Tribunal Constitucional y también por el congreso a iniciativa del primer ministro de entonces, Rodríguez Zapatero. Todos los pueblos tienen el derecho de autodeterminación. En virtud de este derecho, determinan libremente su condición política y proveen también por su desarrollo, económico, social y cultural. Una mentira habitual del ex-ministro García-Margallo es que sólo hay tres constituciones en el mundo que hablan del derecho de autodeterminación. 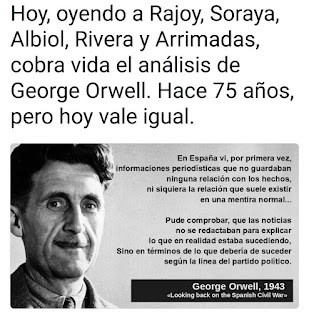 Esto es rotundamente falso. Hay treinta y ocho constituciones que hacen referencia al derecho de autodeterminación y la invocan como fuente de legitimidad. Son ejemplos las de nueve estados de los veintiocho de la Unión Europea: Alemania, Croacia, Eslovaquia, Eslovenia, Estonia, Francia, Hungría, Letonia y Portugal. Aquí puede encontrar todas las referencias. Los tratados internacionales válidamente celebrados formarán parte del ordenamiento interno una vez publicados oficialmente en España. Sus disposiciones sólo podrán ser derogadas, modificadas o suspendidas en la forma prevista en los propios tratados o de acuerdo con las normas generales del derecho internacional. Todos los pueblos tienen el derecho de autodeterminación. En virtud de este derecho establecen libremente su condición política y proveen también por su desarrollo, económico, social y cultural. Apruebo y ratifico todo lo que se dispone, prometiendo cumplirlo, observarlo y hacer que se cumpla y observe puntualmente en todas sus partes. En consecuencia, España está obligada a cumplir y observar el derecho de autodeterminación de los pueblos, pues no puede derogar la obligación impuesta por la ONU y aceptada con la firma de las convenciones. -Entre el 1810 y el 1812, el Principado fue un estado completamente independiente, que mantenía una relación estrecha con el Imperio francés. -El mes de marzo de 1873 la Diputación de Barcelona proclamó el estado catalán, que incluía las cuatro provincias del Principado y las cuatro islas Andalucía. Este estado se integró en la naciente primera república española. -El 1931 y 1934 la Generalitat republicana proclamó la república catalana. Francesc Macià lo hizo el 14 de abril de 1931, pocas horas antes de que en Madrid se proclamara la república española. Tres días después, Macià aceptó que la república catalana fuera parte de la española. Lluís Companys también proclamó la república catalana el 6 de octubre, proclamación que fue abortada militarmente por la república española. Pero el argumento más importante es que es imposible que la fuente de legitimidad de la Generalidad de Cataluña sea la constitución española, si se tiene en cuenta que la Generalitat fue restaurada por España antes de existir la constitución. La restauración de la Generalitat se hace por el Real Decreto Ley 41/1977 de 5 de octubre (disponible aquí), que reconoce la legitimidad del presidente Josep Tarradellas, presidente elegido por las instituciones de la república. La constitución española no se aprobó hasta el 29 de diciembre de 1978, que es cuando se publica en el BOE: la Generalitat de Cataluña ya funcionaba desde hacía más de un año. Finalmente, a raíz de la independencia unilateral de Kossovo, una sentencia histórica de la Corte Internacional de Justicia (que puede encontrar aquí) dejó claro que la ley internacional no contenía ninguna prohibición que se pudiera utilizar para detener una declaración unilateral de independencia. 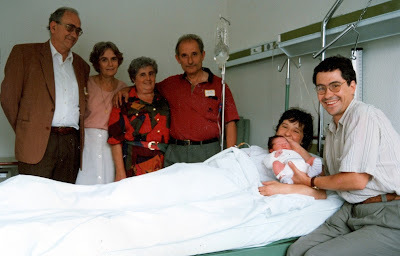 Si una persona decide no ser súbdita de un rey determinado es su opción personal y no va más allá. Si yo y todas mis vecinas también compartimos esta misma idea (el 95% en mi municipio) elegimos un gobierno local que comparte esa idea. Cuando vemos que el 75% de los alcaldes de mi país también comparte esta idea elegimos un gobierno que nos representa y la comparte, con la condición de que se comprometa a preguntarnos a todas nuestra opinión sobre el tema. 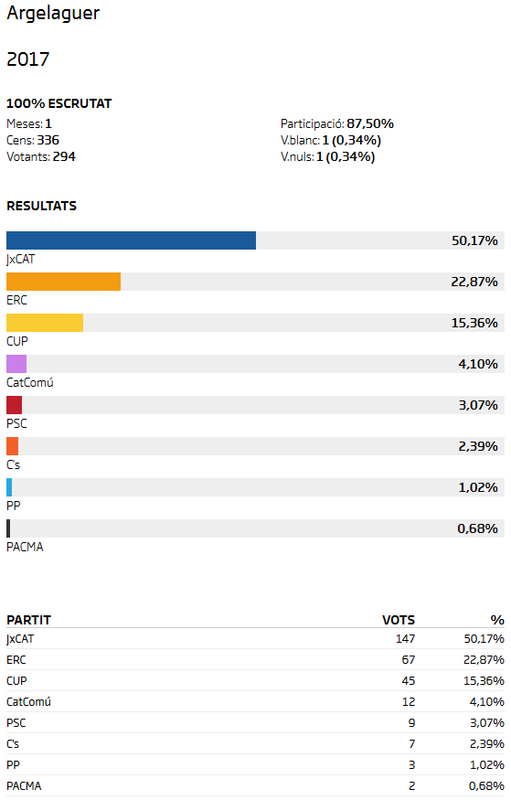 Pocas veces los gobernantes de Catalunya habían demostrado tanto valor y coherencia. Comparto testimonios audiovisuales pues podrían ser censurados en breve, aquí se están conculcando derechos fundamentales de libertad de expresión y se ponen filtros a la difusión universal de la información. Lluny d'aquí, nou clip de TORTELLINIS! Una cançó plena d'optimisme des de Catalunya pel món. Per acompanyar tots els terratrèmols que estem vivint en aquests moments. Avui fa 24 anys que ens vas donar l'alegria més gran de la vida. T'estimem, Joan! Del 30 de juliol al 2 d’agost Argelaguer acollirà el primer campus de jazz. 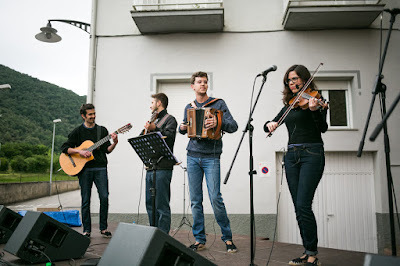 Es tracta d’una escola d’estiu dedicada a la música improvisada en sessions de grup que, per seguir la tradició del municipi, tindrà el violí com a un dels instruments referencials. Diàriament es faran tallers de percussió corporal, d'instruments, veu inclosa, i el curs central d'improvisació. El professorat està encapçalat per noms prou coneguts com Christoph Mallinger, Lu Arroyo i Andrea Motis. Les inscripcions estan obertes i encara queden places, que són limitades. Per inscriure's cal omplir aquest FORMULARI que també es troba a l'adreça web on hi ha tota la informació detallada: https://jazstiu.blogspot.com. Però, a més dels tallers, el JazStiu també comptarà amb concerts gratuïts, el primer dels quals tindrà lloc diumenge 30 de juliol, a 2/4 de 10 del vespre, a l’Era de la Rectoria d’Argelaguer, a càrrec del quintet format pel mateix Christoph Mallinger (violí i veu), Andrea Motis (trompeta i veu), Dani Pérez (guitarra), Martin Heinzle (contrabaix) i Esteve Pi (bateria) i s’inclourà dins la programació d’estiu a la fresca d’Argelaguer. 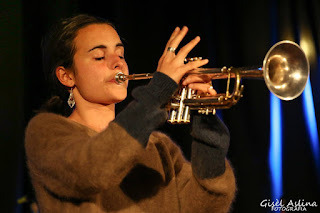 El dilluns 31, a la mateixa hora, hi haurà una jam session a l’Era de la Rectoria i dimarts 1 d’agost, també a 2/4 de 10 del vespre la formació garrotxina Trujazz XL oferirà un concert al bar-piscina de Tortellà. 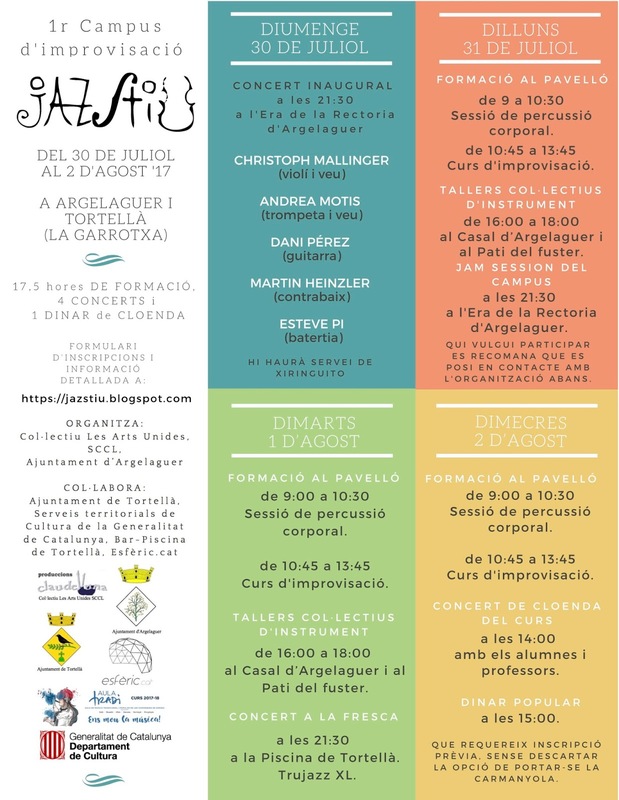 Finalment, el dimecres 2 d’agost tindrà lloc el concert de final del curs amb l’actuació d’alumnes i professors i, tot seguit, un dinar de cloenda al pavelló d’Argelaguer, del que cal fer inscripció prèvia. Fa pocs dies hi vam estar amb Los colors de la jota, proposta de La Clavellinera, i el 23 de juliol hi tornarem amb Corrandes són corrandes. Fa il·lusió retrobar el projecte, en aquest cas fent un "cover". 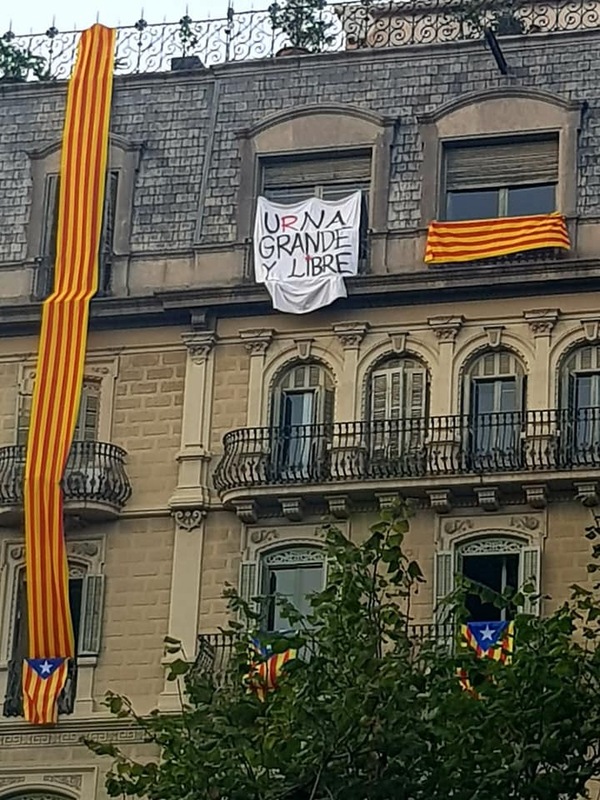 Moltes gràcies, gent de la Vilella Alta. Són molts quilòmetres, però és tot recte! Aquest estiu els nostres nois tenen una llarga llista de concerts, intentarem anar seguint el seu ritme! Enguany hi anem tres formadors des d'Argelaguer, en Panxito amb tota la corda, l'Alba per fer les delícies dels menuts, i s'estrena en Guillem Ballaz, el senyor dels panderos! 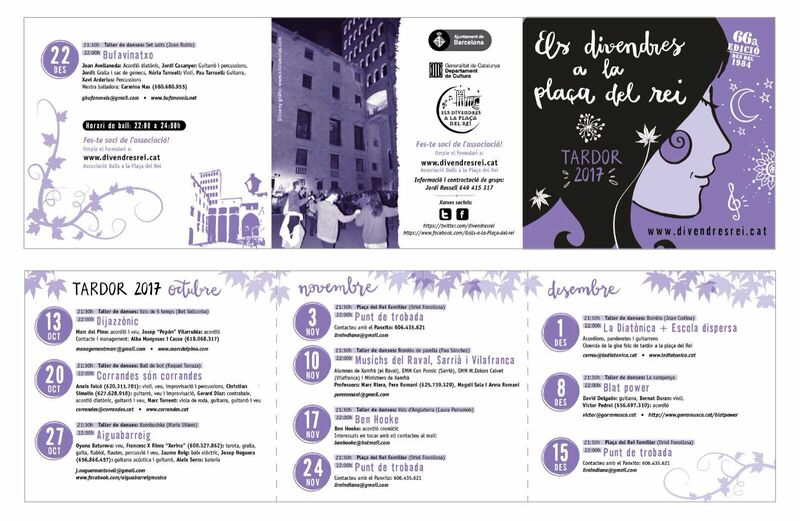 Del 25 al 29 de juliol el Poblenou del Delta es converteix en seu d'aquesta escola d'estiu de música i cultura popular i tradicional. Un entorn i un ambient ideal, i remarcable la gastronomia! Encara podeu fer les vostres inscripcions aquí. 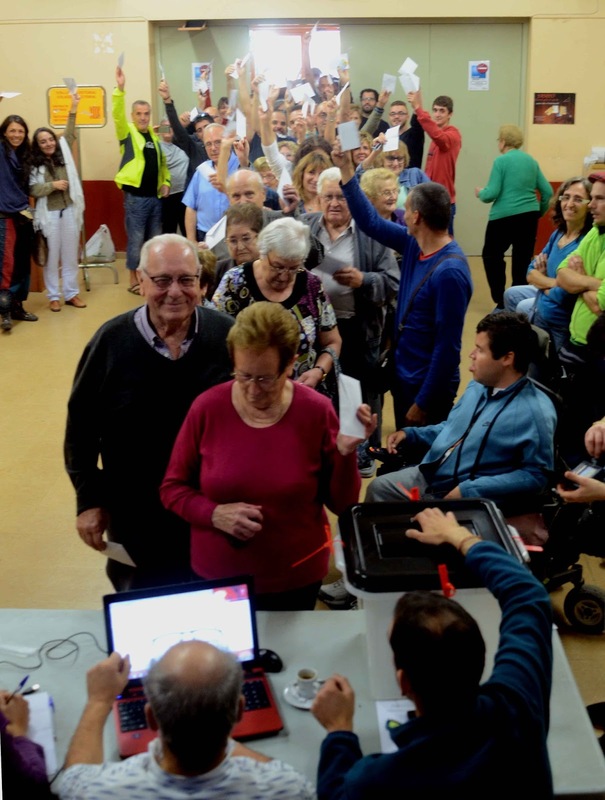 A La Vilella Alta la proposta va ser molt ben rebuda per la població. 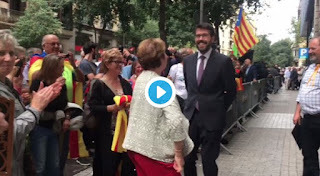 La companyia va ser molt grata i encertada, i la banda també va contribuir a l'èxit. Ens ho vam passar molt bé i ara ens esperen al Tradicionàrius de Mas de Barberans, i nosaltres també ho esperem amb molta il·lusió. La cita serà dissabte 5 d'agost a les 19:30. No hi podeu faltar! 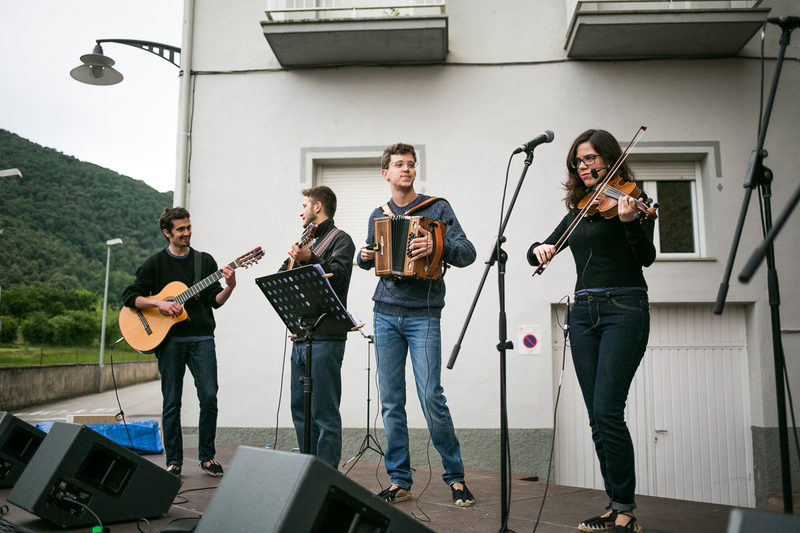 Argelaguer i Tortellà acullen per primer cop conjuntament un Campus de Cultura, el jazStiu 2017. En aquesta primera edició ens centrarem en el llenguatge jazzístic, prenent el violí com un dels seus instruments referencials. Aquest concert està inclòs dins la programació d'estiu a la fresca d'Argelaguer. 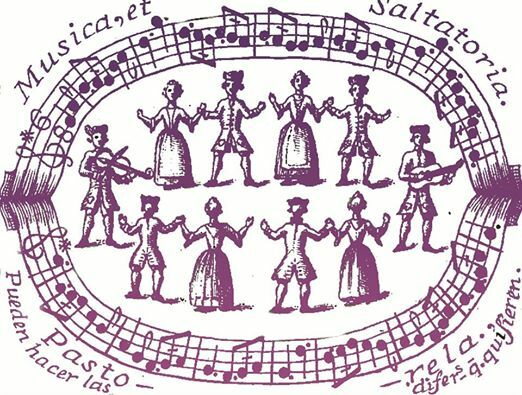 El curs comença el dilluns 31 de juliol. Cada dia obrirem amb una sessió de percussió corporal d'una hora i mitja, a càrrec de Lu Arroyo, amb aquests continguts. Continuarem amb el curs d'improvisació de tres hores diàries, impartit pel tàndem Christoph Mallinger & Andrea Motis, amb el suport de Joan Tomàs. L'estona de dinar és lliure, amb possibilitat de trobades informals. Hi haurà també un pacte amb el Bar Piscina de Tortellà. El vespre del dilluns es farà la primera jam session del Campus, a la Plaça de la Generalitat d'Argelaguer. Qui vulgui participar es recomana que es posi en contacte amb l'organització abans. Dimarts 1 d'agost a les 10 del vespre s'oferirà un concert gratuït a l'Espai Cúpula del Bar Piscina de Tortellà amb el grup garrotxí TruJazz XL. Dimecres al migdia hi haurà una jam/vermut de cloenda dels curs amb els alumnes i professors, i acabarem amb un dinar popular que requereix inscripció prèvia, sense descartar la opció de portar-se la carmanyola. Esperem que ens acompanyeu aquest 4 dies a la Vall del Llierca. Hi ha diverses opcions d'allotjament i possibilitat d'acampar al costat del pavelló. Com cada any l'Esbart Marboleny torna a ballar a L'Estartit. 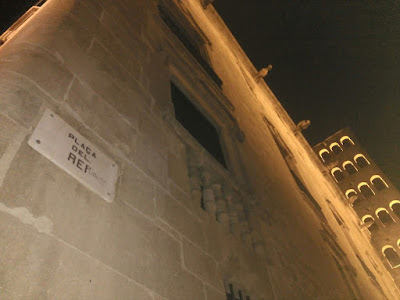 El dia 23 de juliol a la nit. La música en directe, com sempre. 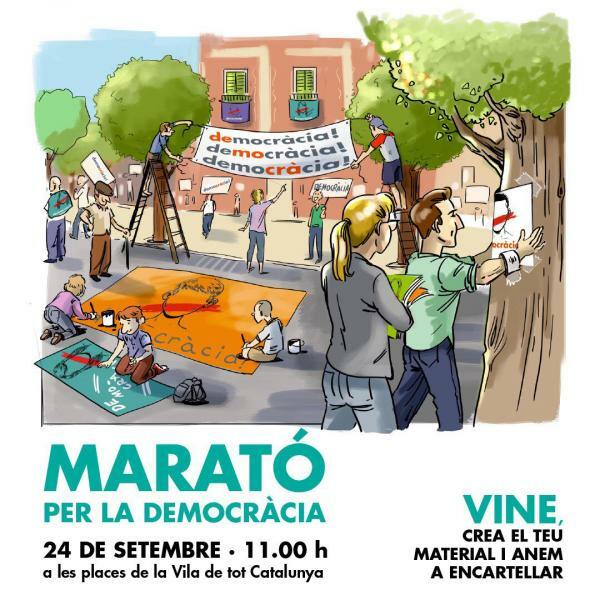 a càrrec de Marbolets! 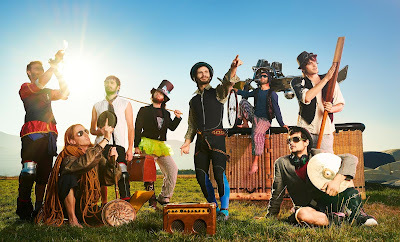 Un plaer compartir amb aquests cracks l'amor per la música de ball, l'alegria i la energia que transmeten i el saber fer. Sant Jaume de Llierca realitzarà durant aquest mes de juliol en el marc de les activitats d’estiu del municipi, dos concerts amb els grups Agnès & the pèpits i la Criatura Verda. Tots dos concerts tindran lloc a la Plaça del Casal. 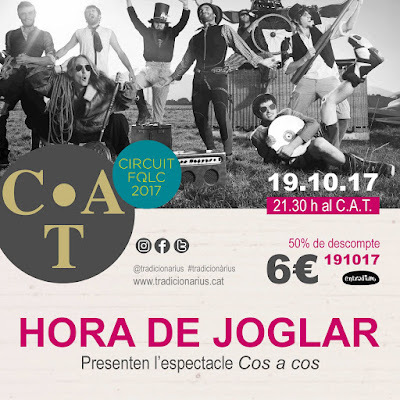 Dijous dia 6 a les 22:00h a la plaça del casal concert d’Agnès & the pèpits. Agnès & the pèpits es un grup que va néixer a mitjans d’estiu del 2014 a la Garrotxa que fa música de cantautor amb un caire folk. L’Agnès Algueró, ànima i motor del grup, tot i la seva joventut, va decidir encetar el seu propi projecte per crear les seves pròpies composicions. 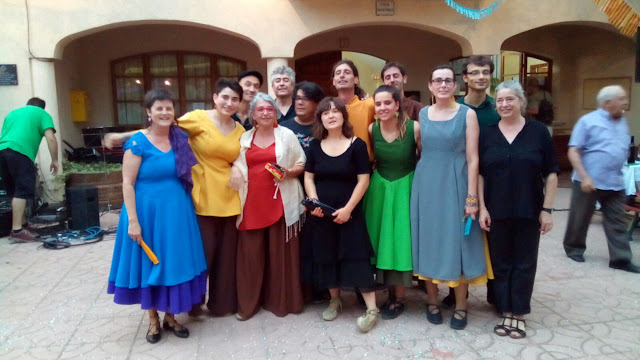 La seva trajectòria musical inclou diferents grups de ministrers i diverses col·laboracions amb el cantant olotí Àngel Girona amb la flauta travessera. Ara, per poder tirar endavant el projecte l’acompanyen un parell de còmplices molt diferents. Per una banda, en Dani López, un increïble i excepcional multi-instrumentista amb gran capacitat per les harmonitzacions i per l’altra, en Miquel Pascal, un músic amb dilatada experiència musical. Dia 13 de juliol a les 22 h a la Plaça de Sant Jaume de Llierca, concert de la Criatura Verda. 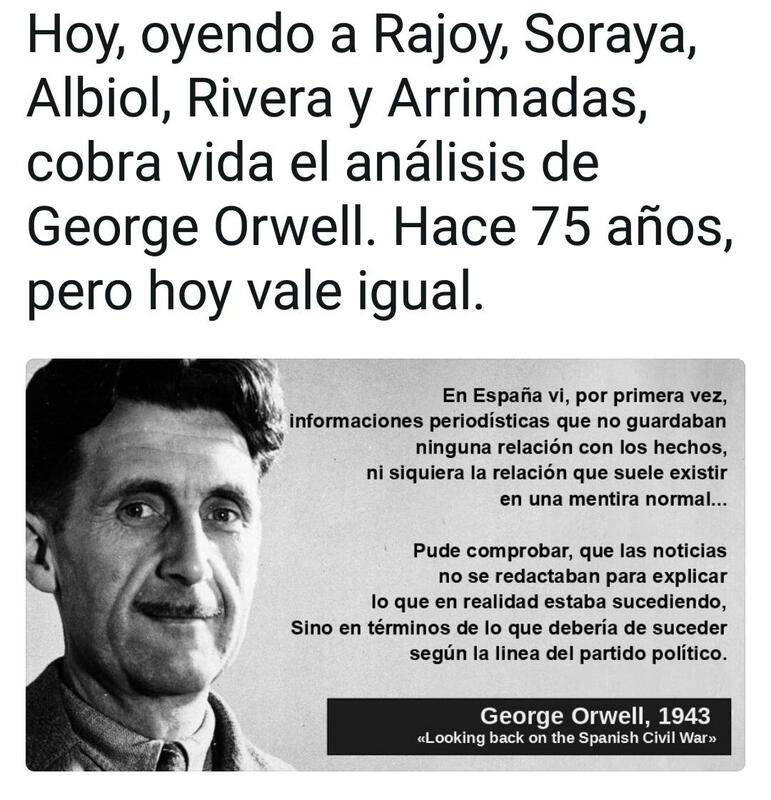 En aquest ocasió La Criatura Verda es presentarà en format de tercet. Darrerament la veterana formació garrotxina de música tradicional dotada de la veu personalíssima de Laura Plasencia ha participat en esdeveniments de proximitat: l'Aplec dels francesos de Sant Aniol, la festa del Roser de Serinyà, aplec de Punta Falconera de Roses, fira tèxtil de Salt; i a festivals especialitzats com el Tartareu folk. 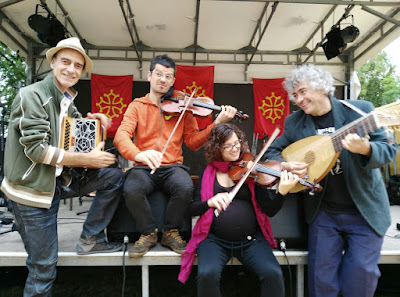 la festa de Castelnau-Barbarens a Occitània.